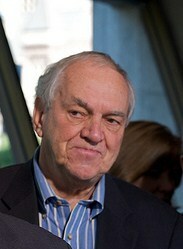 Ed Broadbent believes most Canadians would be willing to pay higher taxes. He has a caveat: The alleged willingness to pay is based on some assurance that the tax increase would lead to improved government social services. Broadbent is an eminence grise of Canadian social democracy. He comes by his status because he was the highly respected leader of the federal New Democrats for several years before the turn of the century. In the view of people like United Church minister and former NDP deputy leader Bill Blaikie, he might be described as being to the political left what Preston Manning is to the right side of the spectrum. I watched Broadbent interact with Evan Solomon last night (April 10) on CBC’s Power and Politics (P&P). Solomon grilled the gruff-but-genial senior about the Broadbent Institute’s (BI) recent Environics poll. That survey reported the above-mentioned findings with respect to our nation’s alleged willingness, under certain altruistic conditions, to pay higher taxes. Solomon was able to get Broadbent to suggest the Manning Centre’s contention that Canadians would really prefer lower taxes was skewed by leading questions. BI’s own poll, he claimed, was just the opposite. No admission by him that vague promises of good government social services were going to skew the answers of those contacted by Environics! Solomon finished the interview by asking whether Broadbent would be willing to debate Manning on the tax issue. He allowed that he would, saying that he likes Manning’s “demeanor”, even if he argues with the results of the Manning Centre’s poll results. If both men agreed, the debate would be staged on P&P. I would caution Manning to be careful about engaging in a debate with Broadbent, especially if it stood to turn into an argument about whether higher taxation is a good thing or bad. https://canadianchristianity.com/politics/ottawa-watch/page/2/. Entitled Wit to Win, it might be worth a re-read before I wrap up today’s piece. The aforementioned Bill Blaikie, in defence of the social gospel often espoused by left-wing Christians, has been on record in the past couple of years, as implying that fiscal conservatism and the free market system are an antithesis to said social gospel. Jesus, he would argue, is more interested in helping the poor and the working stiff than he is in making rich people richer. If push came to shove, my guess would be that Manning would not disagree with the part of Blaikie’s argument citing Jesus’ interest in the gospel’s positive impact on, for example, alleviating poverty. Indeed, Manning has often led the centre-right side of political thinking in the quest to seriously research study and try out conservative, non-profit and for-profit means to address legitimate questions raised by people on the political left. So he would respond to Broadbent that the issues raised by social democracy and the social gospel get some pretty good answers from the more conservative side of the political spectrum. Indeed, some of the most useful answers come often from some pretty rich Christian people who would not have too much trouble going through the eye of a needle. (See Matthew 19:24). One such rich guy is Jim Pattison, 83, a Pentecostal trumpet-playing industrialist who was wise enough, a few years ago, to recruit a former British Columbia NDP premier to help run his fiscal empire. That former premier, Glen Clark, is now Pattison’s president. True, he is still a social democrat: he even contributed financially to BC MP Nathan Cullen’s recent run for the NDP leadership. My point is that one who has the “wit to win” by drawing a circle that takes in his or her political opponents, can, in a very real sense, be doing God’s work. I will end this piece today, as I usually do when advancing these conciliatory or collaborative ideas, by admitting that it will be a long time before class warfare or adversarial politics vanish from the land. It took 50 years for Britain to eliminate the slave trade, after Christian statesman William Wilberforce first embarked on that project before the end of the 18th century. So be careful, Preston, about whether or how you engage Ed Broadbent in this discussion. But don’t completely rule out the idea, on first blush. Lloyd has begun work on his doctorate in ministry through Tyndale Seminary in Toronto. He hopes that his thesis research will relate, in part at least, to the role of faith-based organizations in meeting community needs. He welcomes your feedback into his research through responses to his OttawaWatch columns posted on www.canadianchristianity.com. Please respond in the comments section of his columns, or directly e-mail Lloyd. Thank you.